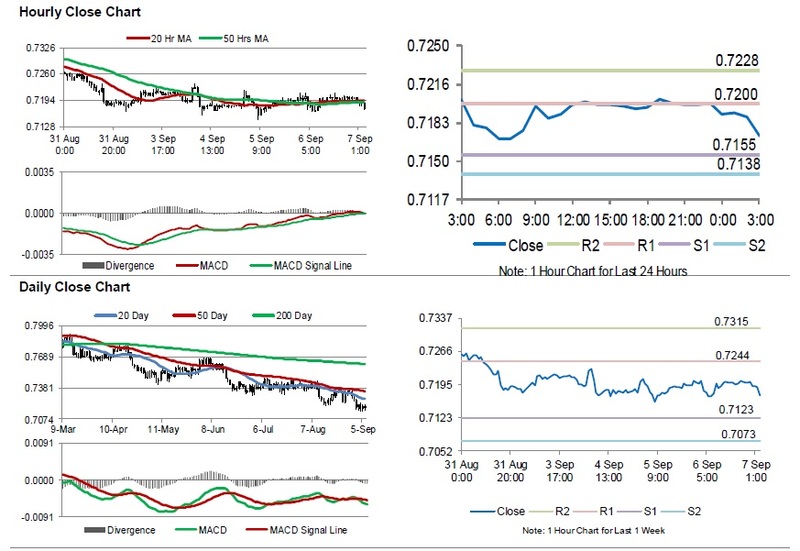 AUD/USD: Aussie trading lower in the Asian session. For the 24 hours to 23:00 GMT, the AUD rose 0.10% against the USD and closed at 0.7200. LME Copper prices rose 1.5% or $90.0/MT to $5940.0/MT. Aluminium prices declined 0.8% or $15.5/MT to $2030.5/MT. In the Asian session, at GMT0300, the pair is trading at 0.7172, with the AUD trading 0.39% lower against the USD from yesterday’s close. Overnight data indicated that the AIG performance of construction index eased to a level of 51.8 in August, compared to a reading of 52.0 in the previous month. On the contrary, seasonally adjusted home loan approvals unexpectedly rose 0.4% on a monthly basis in July. Home loan approvals had fallen by a revised 0.8% in the previous month. The pair is expected to find support at 0.7155, and a fall through could take it to the next support level of 0.7138. The pair is expected to find its first resistance at 0.72, and a rise through could take it to the next resistance level of 0.7228. Trading trend in the Aussie is expected to be determined by the Australia’s NAB business confidence, Westpac consumer confidence index and unemployment rate, all set to release next week.